August 28, 2017 (San Diego) – As triple-digit temperatures approach San Diego over the next several days, San Diego Gas & Electric (SDG&E) is sharing energy-savings tips to ensure customers have the latest tools and resources to make smart energy choices and save money. While SDG&E is operationally prepared to meet energy demand and there is no formal call for conservation at this time, SDG&E is reminding customers that making small changes to save energy can help avoid high bills caused by increased energy use. May 8, 2017 (San Diego's East County) - With a hotter than normal summer season expected, it’s important to have a place for seniors to stay cool. 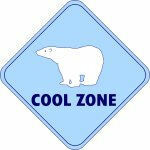 That’s where Cool Zones come in. July 3, 2013 (San Diego) – As temperatures climb, it’s important to stay cool. Seniors and those without air conditioning are particularly vulnerable to heat-related illness. The County has provided a list of “cool zones” where you can beat the heat, including places in East County, such as libraries and senior centers: http://www.sdcounty.ca.gov/hhsa/programs/ais/documents/coolzones.pdf. All are free and open to the public during designated hours.